An amazing final release of downtown Vancouver Concord Pacific luxury condos and townhome villas are now on the market through the Platinum Collection! Located in the master planned waterfront Vancouver community of Concord Pacific across from Southeast False Creek comes the final homes for sale at The Platinum Collection Flagship, The Erickson and Coopers Lookout! Enjoy the stunning water views and lush greenery of the beautiful parks along the Concord Pacific Vancouver waterfront district. Ride your bike or run along the seawall, just steps away from your luxury Vancouver condo home. Browse the fashionable boutique shops of nearby Yaletown or dine in one of the area’s many fine eateries and restaurants. 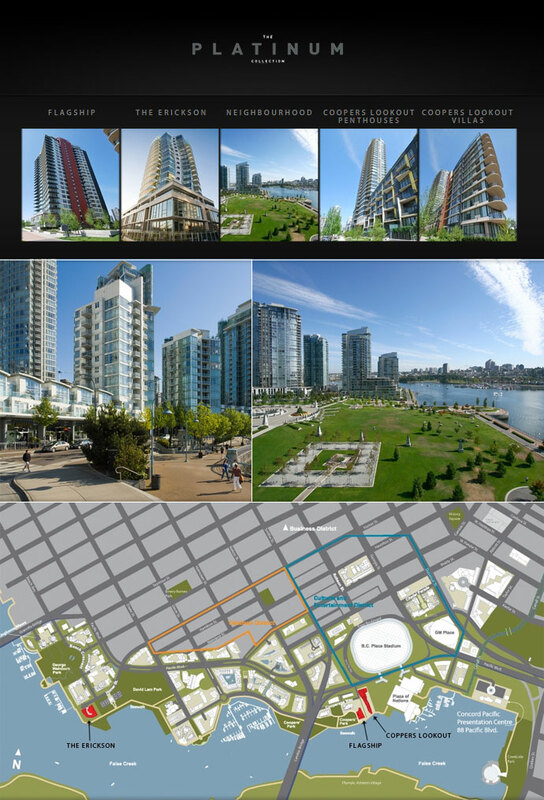 It’s all here at Concord Pacific Vancouver waterfront community and available through the new Platinum Collection. 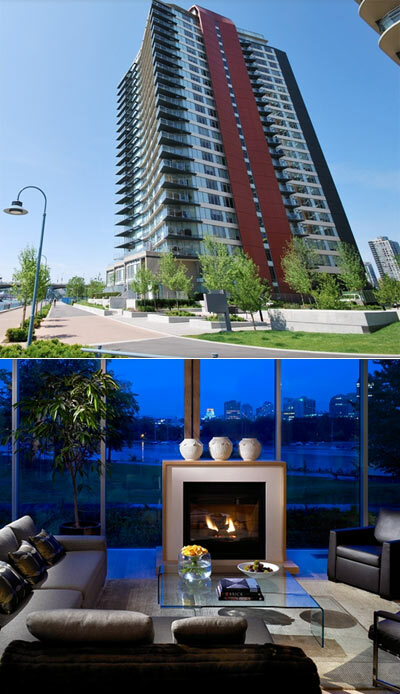 Sophisticated waterfront condo living as you’ve imagined it is not attainable through the final Platinum Collection release of Coopers Lookout Penthouses and Villas, The Erickson Condo Tower and The Flagship by Concord Pacific. For all the details of the remaining suites now on the market, please refer to the Platinum Collection Concord Pacific website located online at www.concordpacific.com/platinum/ today! There, you will also find neighbourhood maps and images as well as contact information. For more details about the Concord Platinum Collection of luxury waterfront Vancouver condos, please visit the presentation centre located along the boardwalk at 88 Pacific Boulevard, Vancouver, BC. You can call ahead to 604.899.8800 or email marketing@concordpacific.com today. Amazing new opportunities to purchase waterfront Vancouver condos at The Flagship are now available in the Platinum Collection just released! Some of the great amenities here at the Flagship Vancouver condo tower include a third level that includes a two lane 10 pin bowling alley with lounge/clubhouse in addition to the fleet of kayaks available to residents and homeowners. The Platinum Collection Flagship Vancouver condos also features a billiards/sports lounge, multi-purpose room with kitchen, Hollywood style screening room, Espirit Lounge, massage and spa room and yoga/pilates room on the second floor. More on site amenities at the luxury Flagship Platinum Collection Vancouver condos for sale include a sixty foot indoor swimming pool and whirlpool, steam room/sauna, men’s and women’s change room in addition to a fully equipped fitness room. The Platinum Collection Flagship Vancouver condos for sale will feature interior finishes that include over height ceilings in majority of living spaces, TV/phone outlets in every room, large format porcelain tiling in the enclosed balcony, open balconies, custom roller shade window coverings, expansive windows with views, Miele washer/dryer, shelving in closets, gas fireplace with custom marble/quartz engineered stone surround, high quality tufted plush pile carpeting, hardwood flooring and much more! In addition, the waterfront Vancouver Platinum Collection Flagship condominiums for sale will have large format stone tiling in the master ensuite bathrooms as well as recessed pot lights, dual flush toilets, custom mirror, frameless glass shower, polished chrome hardware, under counter motion controlled lighting, floating cabinet with Perla lacquer finish, and custom glass countertops with integrated double sinks. The gourmet kitchens at the presale Vancouver Flagship Platinum Collection Concord Pacific condo offering includes imported stainless steel appliance set that includes Miele, Sub-Zero, Viking and in suite disposal, recessed pot task lighting, undermount sink, marble or quartz counters, lacquer cabinetry, stained white oak cabinets and imported Euro style kitchens. The building entryway at the luxury Flagship Vancouver condo tower features double height entrance with foyer, concierge desk in addition to security fob access, underground secure parking, video controlled enterphone and building concierge. The Platinum Collection at The Flagship Vancouver is definitely worth a look! The availability of The Flagship Platinum Collection suites includes a Vancouver Townhome Suite 108 (2 bedroom plus den) at 1509 sqft interior living space plus a 473 sqft roof terrace. Also available is a Vancouver Flagship penthouse suite #2801 which is a 2 bedroom plus den plus entertainment room floorplan of 3036 sqft and an expansive 2203 sqft rooftop terrace. The last suite for sale at the new Vancouver Flagship penthouse level is Unit #2802 which is a 2 bedroom floorplan at 1329 sqft with 558 sqft terrace. Ultimate Erickson. Uniquely Vancouver. Unparalleled Luxury. This new landmark Vancouver condo tower is about to be finished, and The Erickson Platinum Collection allows homebuyers to make one last pitch at purchasing a brand new waterfront condominium that is set along one of the most beautiful seawalls and location imaginable. 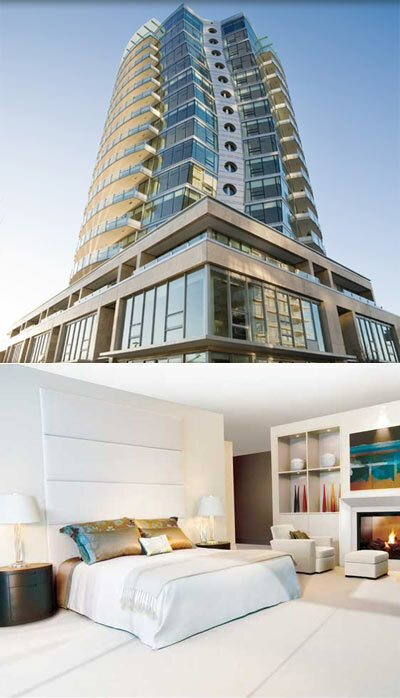 This ultra luxurious Concord Pacific Erickson Vancouver condo tower is designed by the late Arthur Erickson, and is one of the most beautiful and iconic landmark condominium high-rises in the city core. Expansive suites in addition to high end amenities are signature features here. For those home buyers who want the most prestigious condominium here at the Platinum Collection at Erickson by Concord Pacific, you can expect to find a full service 24 hour concierge on site, Fendi Casa furniture lavishly displayed in the entry lobby, 60 foot indoor ozonized pool with underwater sound system, Whirlpool, steam room and infrared saunas in addition to a massage and spa facility. In addition, The Erickson Vancouver condos through the Platinum Collection will also feature such things as a personal hair salon, fully equipped fitness room, yoga/pilates studio, change rooms, state of the art movie screening room and a private board room too! The features are outstanding as well and will include such highend finishes as cove ceilings with recessed pot lighting, flush mounted baseboards, expansive windows with great views overlooking False Creek Vancouver waterfront district, custom roller shade window blinds, high quality wool blend carpets, dark smoked oak engineered wood floors, European awning style kitchen cabinetry, designer selected colour palettes, limestone fireplace, contemporary great rooms and central air con and heating system. The open concept kitchen spaces at The Erickson Vancouver condos for sale at The Platinum Collection by Concord include a gourmet appliance set of Viking, Sub-Zero and Miele, pull out full height pantry, recessed lighting, under counter task lights, built in silverware tray, limestone counters/backsplash, soft touch closures, walnut cabinets, SeiMatic Germany Euro kitchen systems and islands in some floorplans. Also available in the Platinum Collection Erickson Vancouver luxury condos are limestone walls/flooring in the master ensuites along with polished glass counters, undermount porcelain sinks, wall hung custom millwork cabinetry, Dornbrach fixtures, TOTO toilet system, structural glass shower with setam and infloor heating. Open air living is also essential and available in these floorplans at the Erickson Vancouver waterfront condos and there are curb free access from inside to outside, expansive operable window system, dual gas outlets, tiled surface and sprinkler system. The entrance features refined landscaping, bold architecture, 24 hour concierge. In addition, all homes will have doube gated garages for waterfront Erickson townhome residences and individual private garages for all residences. The only available Platinum Collection Erickson Vancouver condo for sale is at 290 Beach Crescent which features a two bedroom floorplan at 1837 sq ft over 2 levels and also a 525 sqft terrace balcony areas. Live with a view to all possibilities here a the waterfront Vancouver Coopers Lookout Penthouse suites for sale! An amazing residential building of utmost prestige and luxury finishes features the final Vancouver penthouse suites for sale. Not only are you at the top of the world, but you are also along the beautiful Concord Pacific waterfront seawall. The available Platinum Collection penthouse includes custom wood cabinetry in the kitchen along with granite stone counters, granite slab backsplash, large format porcelain flooring, gourmet appliance package, under mount sink and task lighting. The Coopers Lookout penthouse suites also have custom wood vanity with marble countertops in the master ensuite along with custom wood/glass shelving units, low profile toilet, marble flooring and wall tiles, infloor heating, drop in soaker tub, steam shower with structural glass enclosure and bench seating and custom light fixtures. Also available in all suites here at the luxury Vancouver Coopers Lookout penthouses are custom roller shade blinds, interior closet organizers, luxurious custom woven carpeting, hardwood floors, gas fireplace with marble surround, air con and heating as well as large ceilings. The Platinum Collection Coopers Lookout Vancouver penthouses will also feature such things as secure underground parking, key fob security access into the building, video controlled enter phone, built in security systems and building concierge. The balconies are large and perfect for entertaining friends and family. The guest ensuite here at the Platinum Collection Vancouver Coopers Lookout penthouses will have custom marble counters, custom cabinetry, low profile toilets and full size soaker tub and shower combo. The amenities at this Vancouver waterfront condo tower includes a sixty foot indoor pool, Whirlpool, full sized fitness gym, change rooms (his/hers) and steam room/saunas. Also available on site are billiards and sports lounge, yoga/pilates studio, massage/spa room, Esprit Lounge, movie room and multi purpose room with catering kitchen. The Vancouver Coopers Lookout condo building also features a two lane ten pin bowling alley with lounge and a fleet of kayaks. There are currently 2 Coopers Lookout penthouse suites available in the Concord Pacific Platinum Collection that includes Suite #3501 which is a three bedroom plus nook plus family room and den floorplan of 2351 square feet and a roof terrace of 450sqft. Penthouse 3505 at Coopers Lookout Vancouver is 1701 square feet with a 200 sf terrace and features a family room, nook and two bedrooms. Sharing the same onsite amenities (as listed above) ad similar features and interior finishes, the luxury Vancouver Coopers Lookout Villas are now available through the Concord Platinum Collection release as well. As with the penthouses, the waterfront villas will also have heating/air conditioning systems, Euro style kitchens with high-end appliances, spa inspired bathrooms and the finest finishes that a luxury Vancouver homebuyer expects. In addition, the Coopers Lookout Villas will have only one suite per floor with a marble elevator foyer with border detailing into the Villas Suites. These spectacular new Vancouver Coopers Lookout Villas are only available through the Concord Platinum Collection and includes 3 residences for sale. The first is Villa 200 which is a 2 bed plus nook and den floorplate with 1975 sqft of interior living space and a 128 sqft balcony. Coopers Lookout Villa 1000 is 2034 sf and has a 159sf roof patio. Last but not least, as featured on the Concord Platinum Collection website is the larger Villa 1100 which is a spacious 2859 square foot multi-level floorplan which features three bedrooms, family room and nook. There is also a 233 square foot terrace too. Again, for more information regarding the Concord Pacific Platinum Collection of luxury Vancouver condos, penthouses and villas at The Flagship, The Erickson, and Coopers Lookout, please speak with a sales representative at 88 Pacific Boulevard, Vancouver, BC.